"If you burn it, they will come." And suddenly, the sheer hilarity of the situation washed over me. I was getting all emotional about a few bonfires. Well, 42 bonfires to be exact. That was in 1997--the first time I saw WaterFire, the art installation by sculptor Barnaby Evans that has become Providence's calling card. So, when I returned to Rhode Island's capital city in May of 2000 to see the expanded attraction--97 fires casting their riveting glow along the Woonasquatucket and Moshassuck Rivers--I was certain I'd not be swept up by the mystique. "Thank you, thank you for so much beauty. I listened to the violin echoing under the bridge and if it had been my last experience on earth it would have been perfect. Thank you." Hmm. So maybe it wasn't so odd to get a little mushy over some fires. I turned to Bruce and softly asked, "If I get all misty-eyed when they light the fires, are you going to laugh at me?" So, there we were among the impossible to quantify crowd with our traveling companions, About.com's Casino Gambling Guide Bill Burton and his wife, Sandy, anticipating the start of this beyond-words event at the end of a long day of hunting for Mr. Potato Head (read about that adventure here). I'd tried to describe WaterFire to Bill and Sandy but found myself at a loss to come up with much more than, "They light a bunch of fires on the river and it's really cool—you'll see." Waterplace Park in downtown Providence is at the heart of the city's rejuvenation, and though it's a choice place for a stroll at any time, it's never more spectacular than when its bridges and walkways and its resident gondola are all bathed in the golden glimmer of WaterFire. Barnaby Evans was commissioned to create the First Fire in 1994 in celebration of the tenth anniversary of First Night Providence, the city's New Year's Eve celebration. In 1996, he created Second Fire for the International Sculpture Conference. Those enchanted by his creations soon thereafter organized a fund-raising effort to support a permanent installation. 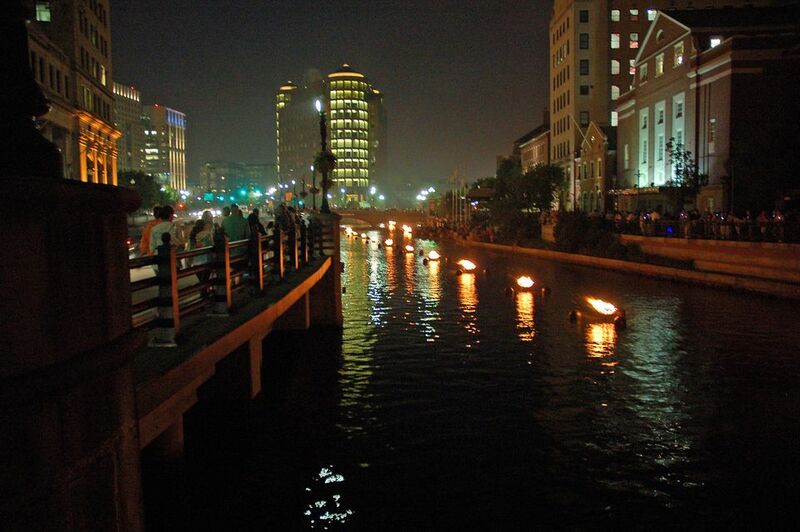 The 1997 season featured 13 WaterFire events that attracted an estimated 350,000 people. The number of bonfires has increased (as of 2016, there are more than 80), and Providence residents and visitors will have an opportunity to see WaterFire during at least 10 full lightings during the 21st anniversary 2016 season, which runs through November 5. The 2016 WaterFire schedule also features several partial lightings. Check the WaterFire Web site for updates, particularly if there is threatening weather. The flaming braziers are ignited shorty after sundown by volunteers who man boats stocked with additional wood supplies that are used to keep the fires burning until the wee hours. The musical accompaniment--selected for each event by Evans--plays until just after midnight. The fragrant mixture of pine, oak and cedar creates an intoxicating smoky perfume that wafts delicately off the water, and the carefully selected score harmonizes with the crackling fires, resonates off the river bridges and streams along the walkways in perfect concert with the flickering flames. From our vantagepoint overlooking the central core of the installation from the street above, we were able to see the torch runners arrive and climb aboard the boats. Another fine place to watch the enchantment is from a gondola on the river. Call La Gondola at 401-421-8877 well in advance to make reservations for a WaterFire evening. Actually, there truly is no "bad" spot from which to watch WaterFire, and you'll want to move about, strolling along the riverside walkways and under the echoing bridges to view the sculpture from many angles. It's a good idea to arrive early in Providence: Crowds begin to accumulate well before sundown. Getting there: WaterFire takes place in downtown Providence on select evenings. From Interstate 95 North or South, take exit 22. The off ramp brings you onto Memorial Boulevard, which runs along the river. WaterFire is on your left after the first set of lights, and the installation extends down past the Crawford Street Bridge. From Route 195, follow the signs for Route 95 north (toward Boston). Stay to the right, take exit 22, and follow the directions above. There is ample parking available--some free, some not. Where to stay: Compare rates and reviews for Providence hotels with TripAdvisor. Bring along: A jacket, as it may be chilly after dark; a loved one to hold hands with as you stroll along the rivers; and tissues if there's any chance you're a sentimental sap like me. Questions? Call the WaterFire office, 401-273-1155, during business hours weekdays.